Amazing ! 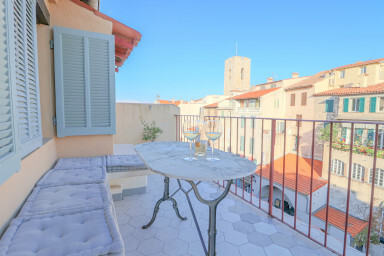 Luxurious & just renovated Duplex with beautiful terrace flat in the heart of old town Antibes, up to 3 people. Provençal charm and comfort with all modern amenities. Ideally located in the main pedestrian streets of the Old City, walking distance from all conveniency and just above the local market, this special duplex in this 17's century building recently renovated by an New Zelander art and interior decoration lover is combining Provençal charm and comfort with all modern amenities. The apartment has been completely renovated with new bathroom, kitchen and furnishings. Both floors are very well conceived which allows for all of the comfort necessary for a perfect stay. On the ground floor you will find a fully equipped kitchen open on a spacious dining table for 4 guests and to the beautiful sunny terrace, a master bedroom and the bathroom with toilets. The second room on the top is open on a comfortable reading nook with fabulous view of the Alpes Mountain. → 4 th floor No elevator, not recommended for people with reduced mobility.